Are you a craft artist? 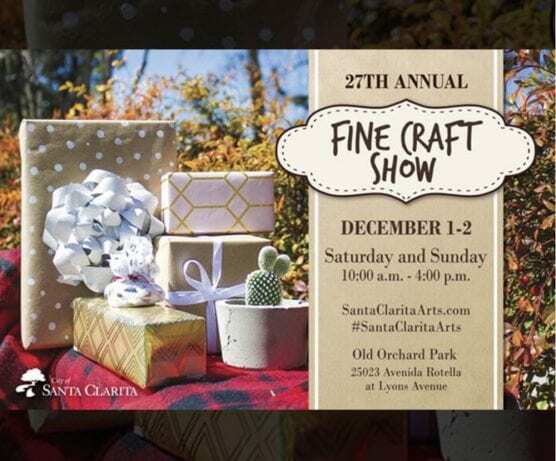 Come be a part of the city of Santa Clarita’s 27th Annual Fine Craft Show. Sign up today to reserve your spot. Space is limited. The Fine Craft Show is free to the public and will be held outdoors at Old Orchard Park, located at 25023 Ave Rotella. Mark your calendar for this exciting event held on Saturday, Dec. 1 from 10:00 a.m. to 4:00 p.m. and Sunday, Dec. 2 from 10:00 a.m. to 4:00 p.m.
We look forward to your participation as a Fine Craft Show vendor, and encourage you to share this information with fellow vendors that may not be aware of the show. As a reminder we do not accept commercial products; items must be handmade or hand embellished. For more information about vendor requirements, pricing and to complete a vendor application, click [here] for our website or contact the Arts and Events Office at (661) 250-3777.